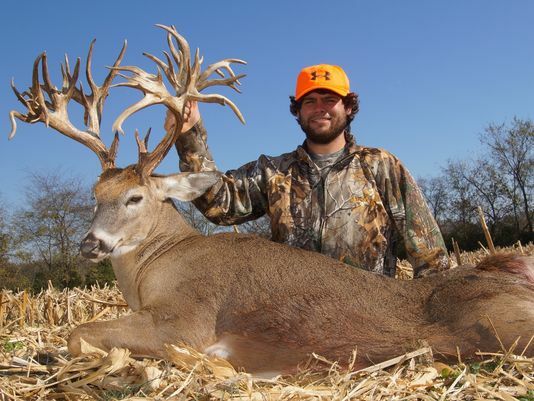 A hunter in Tennessee has landed a possible world record whitetail deer with a muzzleloader. It’s most definitely a state record deer, but the verdict is still out on the world record marks. The official score won’t be finalized until a 60-day drying period. Right now, the deer shot by 26-year-old Stephen Tucker scored a 308 3/8 based on the Boone and Crocket official scoring method, while the world record scored a 307 5/8. The state record for Tennessee is just 244 3/8. Tucker told The Tennessean that he had stalked the deer for two days before getting a fatal shot. He first saw it on Saturday but his muzzleloader miss-fired. He then saw it again but it was too far away. After the 60-day drying period a panel of experts will jointly score the rack so the final results could come out differently. Regardless of the outcome, this 47-point non-typical whitetail buck is certainly a prized animal for any deer hunter. At just 3 1/2 years old, this deer has a tremendous amount of non-typical growth.